The R-31 Command Bridge is the newest and largest of five model offerings for 2014 starting at twenty-one feet from this west coast Washington State builder which has been in the business for over fifty years. 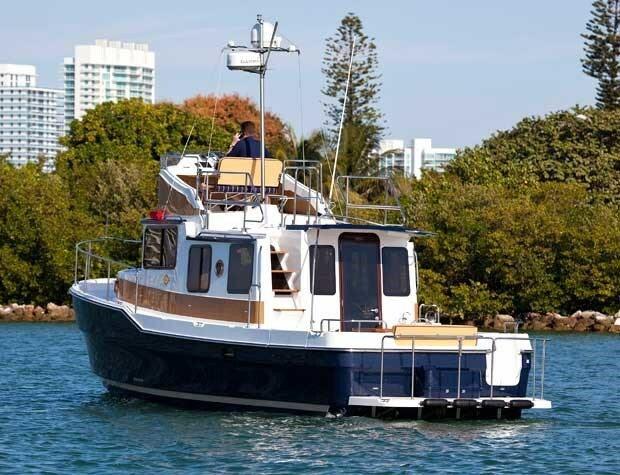 The R-31 is also the first and only flybridge model in the lineup, and with this new flybridge (or Command Bridge as Ranger Tugs refers to it), it takes on a more traditional “trawler” look than the other models. 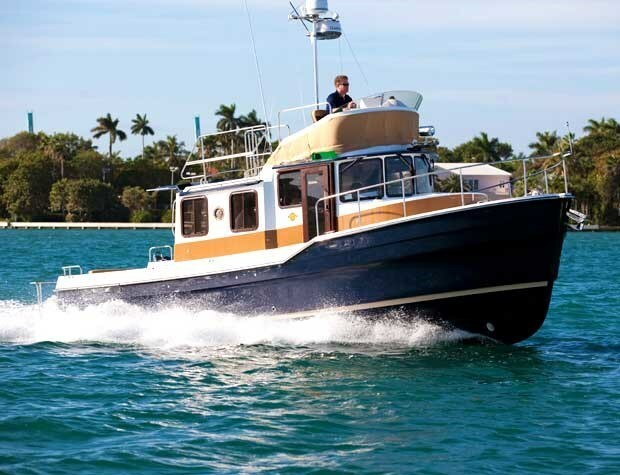 One other major distinguishing feature of the R-31 is, with its standard single 300 horsepower Volvo D4 diesel inboard, it has a substantial claimed cruising speed of fifteen knots or over seventeen miles per hour. That is excellent speed for a thirty-one footer of this design and with this power should have relatively excellent fuel economy at closer to displacement speeds. One of the most noticeable and innovative features of the R-31 is the flexible and spacesaving cockpit seating arrangement. A double or even triple-wide transom bench seat is recessed into the transom to save cockpit space and a double-wide bench seat is built into each side of the cockpit gunwales and literally fold out of each gunwale over the hull sides yet fully retract into the gunwales when not in use. That means built-in seating for at least six in the cockpit. A large two pedestal rectangular cockpit table is available with access from all three of these bench seats. 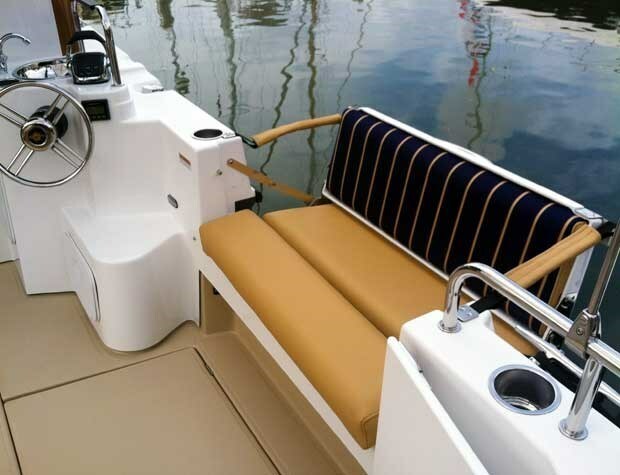 The seat bottom of the transom bench hinges up for access to trunk storage and/or the optional 5 kW Onan generator. 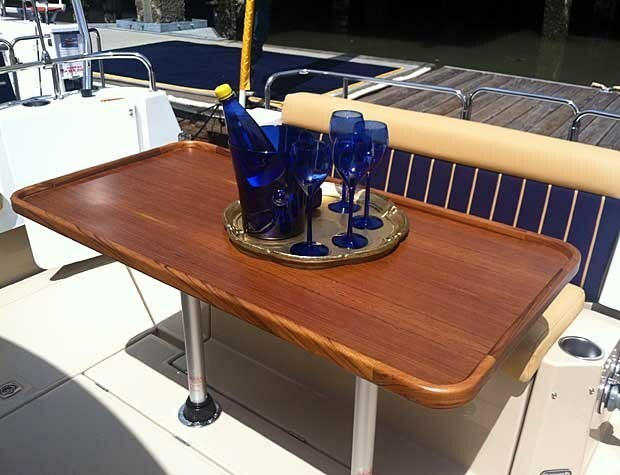 And to add even more innovation and seating flexibility, the R-31 comes with a double-wide bench seat which folds up from within the raised section of the foredeck for forward-facing relaxation and comes with a single pedestal hi-lo table for two. A full height door leads from the cockpit into the one level salon/lower helm of the R-31, and with almost 360-degree surrounding large windows plus two overhead opening hatches, is naturally bright and easy to see everything around the boat. Virtually the entire starboard side of the salon is dedicated to the galley with a two-burner stove plus oven, double stainless sink, below-counter refrigerator, and plenty of drawers and cabinets with an end-to-end solid surface countertop. Even the single swivel lower helm seat folds down out of the way when not in use thus adding even more same level counter space. Opposite the galley to port is a comfortable four seater dinette offering a commanding view through the eye-level all-round cabin windows. This dinette is convertible to a large double berth when necessary. The forward section of the dinette also converts to a two-person forward-facing passenger bench seat while underway. Below the dinette and accessed by stairs immediately inside the cockpit access door is a private guest stateroom with a double berth and a day head. 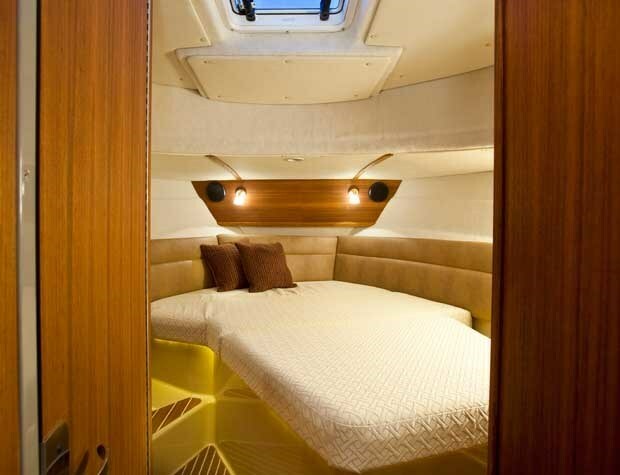 The forward private master stateroom features a raised pedestal bed with easy access, a separate fibreglass-lined master head with shower, and a good-sized hanging locker. If you’re counting, that’s extremely comfortable and private sleeping, seating, and accommodation for four adults and total available sleeping for six adults. Two helm stations are standard on the R-31 with a two-seater fold-down bench seat on the bridge and the aforementioned single lower helm seat. 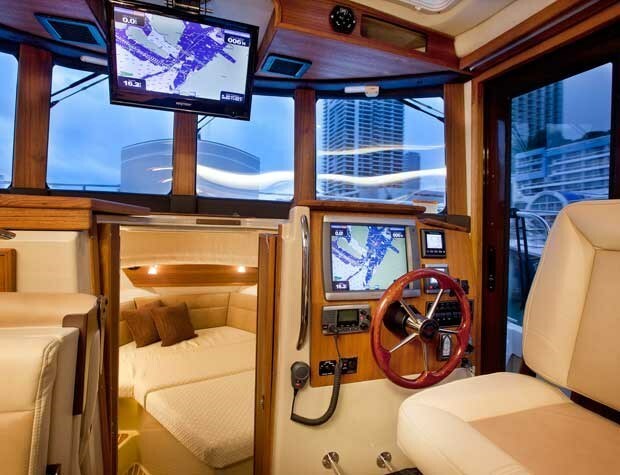 The flybridge is accessed from the cockpit by a six-step staircase. The lower helm features a sliding door immediately beside it for the captain to have quick access to the side deck to assist in docking, etc. With the Volvo electronic controls at both stations, all instrumentation is digital electronic with lots of room at both stations for your choice of navigation electronics. 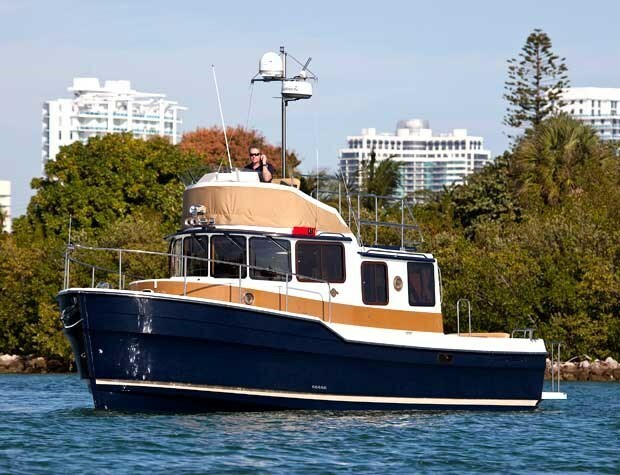 Standard equipment on the R-31 includes most of those features you should have and want in a boat of this kind and includes an almost water-level full-width swim platform with recessed boarding ladder with a starboard side transom access door to the cockpit, both bow and stern thrusters, remote spotlight, and anchor windlass. 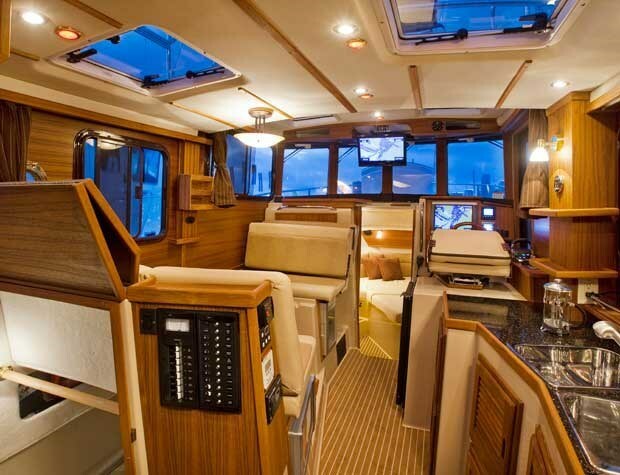 Notable optional equipment includes the aforementioned generator plus air conditioning/heating, cockpit ice maker, a cockpit third helm control centre, and even a solar panel. The Ranger Tugs R-31 – unique, innovative, and with attention grabbing eye appeal.